Superglue Is Not an Eye Drop! I came across an interesting article published in the International Journal of Ophthalmology. This study was conducted in 2012-2013 involving patients with superglue injuries to the eyes. I know what you are thinking, and yes, folks, it happens more often than you think. In the study, 105 patients (56 men and 49 women ranging from ages 2-53) were examined over a 3-month span at the Farabi Eye Hospital in Iran. The reasons given for having superglue in the eye included: patient carelessness (78.1%), childhood curiosity and lack of parental supervision (11.4%), storing superglue in inappropriate places and inadvertently using superglue as eye drops due to poor vision (2.9%), inadequate awareness of superglue applications [used to stick on artificial nails (3.8%), artificial eyelashes (1.9%), and broken teeth (1%)], and being assaulted with glue (1%). Never fear, however, as it is not as bad as you think. If this ever happens to you, according to Super Glue Corporation, you should thoroughly wash the eye with warm water and apply a gauze patch, and the eye will open on its own in a few days with no serious damage. SOURCE: Tabatabaei SA, Modanloo S, Ghiyasvand AM, et al. Epidemiological aspects of ocular superglue injuries. Int J Ophthalmol. 2016;9(2):278-81. Bacteria is everywhere, including floors where food can sometimes end up. The age old dilemma is: Is it safe to quickly pick up food and eat without getting sick? NASA engineer Mark Rober decided to test out the 5-second rule (on the Discovery Science Channel show, The Quick and the Curious). To summarize, he confirms that small amounts of bacteria can be found on a piece of food once it hits the ground, but the texture of the food and the surface it falls on makes a big difference. A piece of moist food left on the ground for more than 30 seconds has 10 times more bacteria on it than food that is picked up after 3 seconds. In addition, smooth surfaces such as tile and linoleum transfer more germs—and a lot quicker—than rugs. So the next time food falls on the floor—go ahead—pick it up (quickly) and eat it! Additional information is available from results of a 2014 research study carried out at Aston University’s School of Life and Health Sciences. As a parent of 3 kids involved in youth soccer, I understand how much time and money is needed to keep youth sports teams and clubs running smoothly. Over the years I have helped support, among others, track clubs, cheerleaders, and baseball tournaments. 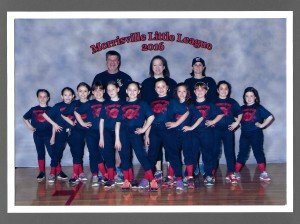 Below is the 2016 Morrisville Little League Minor League B girls softball team sponsored by Normandy Optical. I’m glad I have the opportunity to help these children.